Nicolo Barella wants United move? Cagliari midfielder Nicolo Barella is said to have the ambition of joining Manchester United and would find it hard to turn down their advances in the near future. The 21-year-old has been linked with both Inter Milan and Chelsea this month with reports indicating that the former are leading the race to acquire his services. However, according to Gazzetta dello Sport, United are also understood to hold an interest in the midfielder and it is suggested that the midfielder would find it difficult to snub their approach. 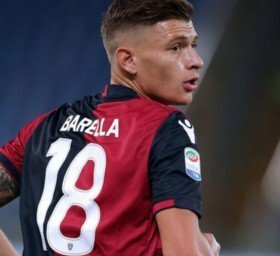 Barella is regarded as one of the best young midfielders in the Italian top tier and he has been a regular for Cagliari this term with 22 appearances including 19 in the Serie A. His progress has caught the attention of several elite clubs across Europe but reports indicate that the Italian won't come on the cheap with Cagliari wanting at least £50m to sanction his sale this month.